After a very cold winter, the onset of spring is a welcome event in the nation’s capital. The air is getting warmer, the cherry blossoms are getting ready to bloom, and many cultural venues and attractions are beginning to offer outdoor events and activities. If you’re vacationing in Washington, DC in the springtime, you’re in for a spectacular time. Read on for some of the top things to do and see. Seeing all the sights in DC can be challenging, especially if you’re only in town for a few days. 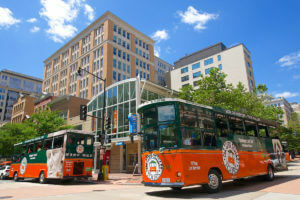 A tour aboard Old Town Trolley is the most comprehensive sightseeing experience in the city with stops at more than 100 of the most popular and important points of interest. The tour will take you to the Lincoln and Jefferson Memorials, the Smithsonian Museums, the Washington Monument, the White House, the National Archives and much more. The best part is you’re able to get off and spend as much time as you’d like at any of the stops, then just hop on the next trolley that comes along. You can even spread your tour out over a few days. Learn the stories around the sights, facts about the people and events and more that shaped American history. Springtime not only brings better weather, it means the DC Ducks are back in action! The DC Ducks are fully restored World War II vessels that were used to carry supplies back and forth to ships that did not have port facilities. These amphibious vehicles are built to go from land to water and back again. Today, you can ride on an authentic Duck and see the sights of DC by land and by sea. The tour is about an hour and a half and takes you past the country’s most famous monuments and museums before splashing down in the Potomac River for more fun and adventure. The DC Ducks tour is the perfect spring outing for kids and adults and a fun and unique way to learn about the history of our nation. Chilly winter nights make way for pleasant evenings once springtime arrives in the nation’s capital. Explore the city after hours aboard Old Town Trolley’s Monuments by Moonlight tour. This nightly adventure makes stops at several notable landmarks including the FDR Memorial, Lincoln Memorial and Martin Luther King, Jr. National Memorial. Sit back, sightsee and hear the stories of Washington DC’s history and famous leaders. What’s better than a day at the Zoo? How about a day at the zoo on a pretty spring morning! Smithsonian’s National Zoo is where you can see more than 2,000 animals of 400 different species. Roam through the 163 acres of this beautiful zoo and see some of the world’s most interesting creatures including the brand new giant panda cub Bao Bao, Asian elephants, lions, gorillas, chimps, porcupines, lemurs, reptiles, birds and much more. From the African Savannah to the Asian Trail and everything in between, the National Zoo has it all. Spend an afternoon at Nationals Park for America’s favorite pastime. The Washington Nationals baseball team kicks off its spring training season in March, with games held in the afternoon and evening. The season officially kicks off in April and runs through October. Enjoy the springtime weather of Washington DC with this family-friendly activity. Nationals Park is located in Southeast Washington, south of the Capitol and along the Capitol Riverfront adjacent to the Navy Yard. The ballpark is approximately 3.5 miles from downtown Washington DC. If you’re traveling by Metro, take the Green Line to the Navy Yard station or the Orange, Blue or Silver Line to the Capitol South station. One of the most famous sights to see in DC in spring is the blossoming cherry trees around the Tidal Basin. An incredible spectacle to behold, the soft pink and white flowers create a picturesque backdrop to the Jefferson Memorial, the lagoon and the surrounding areas. If you’re in Washington, DC between March and April, be sure to attend one of the many events and activities in the annual Cherry Blossom Festival. There are more than 200 cultural performances, nearly 100 special events including the Kite Festival, the National Cherry Blossom Parade and the Japanese Street Festival and an array of other things to see and do. You can also rent a paddle boat and spend an hour on the water admiring the blossoming trees and enjoying the warmth of a sunny spring day. Dating back to 1878 and President Rutherford B. Hayes, the family-friendly White House Easter Egg Roll event is sure to put a smile on your face. Hunt for and race Easter eggs on the White House Lawn, gather round for storytelling and visit with the Easter bunny. The South Lawn is also open for families to enjoy sports, cooking classes, live musical performances and more. For those travelers planning a trip to Washington DC over the Easter holiday, this tradition is a must-do on Easter Monday. ShamrockFest, Washington DC’s annual St. Patrick’s Day street festival, boasts live music, food, an Irish village and tons of carnival games for excited festival guests. Rain or shine, guests can listen to more than 40 bands, including Irish punk, folk music and lively Celtic rock. The festival also features Club DJ Zones where the world’s top DJs perform for huge crowds. Celebrated each April 22 since 1970, Earth Day is a modern environmental movement supported with fun events across the United States. In Washington DC, the holiday is marked with organized clean up events held at the city’s parks and sessions that teach ways to improve the environment and make a difference. These special events take place throughout the month of April at popular landmarks such as the National Mall, Union Station, the National Zoo and the Botanic Garden. The Rock ‘n’ Roll USA Marathon takes runners on a historic route around Washington, DC’s monuments and memorials. Featuring live music and cheer squads along the course, spectators and runners alike enjoy the unique marathon and lively entertainment. If you’re visiting Washington, DC in spring, stop by the Rock ‘n’ Roll USA Marathon for a one-of-a-kind experience. Each year, Filmfest DC showcases the best works from an array of accomplished filmmakers. Enthusiastic audiences gather in DC to watch films from all over the world. From international comedies to thrillers to foodie documentaries, Filmfest DC always promises an unforgettable time for attendees. Enjoy the springtime air and sunny skies with a trip to any of Washington DC’s many farmers markets located throughout the city. Although these markets are open year round, the offers and traffic peak in the spring and summer. Head downtown to Georgetown and even the National Mall for produce, flowers, meats, cheeses, art and antiques. A few of the most popular neighborhood markets include Dupont Circle FRESHFARM Market and Eastern Market. Passport DC is a celebration of international cultures that takes place citywide during the month of May. The Around the World Embassy Tour provides a unique sightseeing experience of the Embassy like you’ve never seen before. Another popular event, the National Asian Heritage Festival on May 18, includes a parade, martial arts demos and a full-on street fair. There are free and paid events all month long. Spring is a favorite time of year for many, and nowhere is this more apparent than in the annual Cherry Blossom Festival in Washington DC. For our nation’s capital, spring signifies the arrival of more than just milder weather. This season marks the blooming of the magnificent cherry blossom trees, creating a vibrant spectacle of gorgeous pink flowers. If you’re planning a visit to DC in the springtime, you’ll be vacationing at just the right time to witness the beauty of the cherry blossoms and participate in the many events surrounding their arrival. The Environmental Film Festival in the Nation’s Capital is a major collaborative event that takes place at more than 50 partnering venues, including museums, embassies, universities, libraries, and theaters across the Washington, D.C. metro area. Screenings are scheduled in all four quadrants of the city and in nearby Maryland. The annual festival takes place during the last 2 weeks in March. Catch an MLB Game at the Nationals Park. Soak up the sun and make monumental memories on the water in a swan boat or paddle boat. Visit in March and April to experience thousands of cherry trees in full bloom, and fill your summer days with leisurely peddling, picturesque views, and picnics in the park. Every third Thursday from 6:30PM-8:30PM enjoy beer tasting and tours of the mansion with exclusive guests and local craft brewery partners. Call the museum at (202) 429-1894 for more information. Get ready for an unexpected night at the ballet. Choreographers Trey McIntyre and Edward Liang of the Washington Ballet artfully apply the classic glam rock music of the late David Bowie and Queen to construct a ballet performance like none you’ve ever seen. This thrilling night of entertainment at the John F. Kennedy Center for the Performing Arts will make you dance in your seat, sing like no one is listening and boogie all the way home. McIntyre transforms into the essence of Queen and Liang takes on the famed character that Bowie became known for. Catch this unique combination of music and dance May 4-15. Ray Charles will forever be an American icon for more reasons than one. His story of beating the odds to achieve impressive success has inspired countless during his lifetime and beyond. The National Museum of American History honors him with a new exhibit titled ‘Ray Charles: The Genius.’ This memorable display highlights the difficulties that Charles overcame, the extraordinary music that he released and his unmatched skills on stage. The museum exhibit is open to the public free of charge through June 5. As part of the 1975 project titled ‘No Mountains in the Way,’ a group of photographers, including Jim Enyeart, took photos of their native Kansas to show the culture, landscape and customs of this mid-western state. The program led to an even larger one that included works from more than 100 photographers across the United States. Discover the awe-inspiring and highly artistic photos that shined light on the country’s most natural elements at the Smithsonian American Art Museum. A special, free of charge exhibit honoring this famed mission is on display through July 31.